We invite you to join us by clicking on the link to the Membership page, then follow the directions to register and join online. If you are not a member of the FMCA you may do the same by going to www.fmca.com. Enjoy your visit to our website ! and…. check out the photo (bottom of the page) – 2018 was our 25th FMCA chapter anniversary – join us for more fun to come. We had a great rally in Perry in March, 2019 and we currently are planning for rallies in Minot, North Dakota in August 2019, Tucson, Arizona in March 2020, Syracuse, New York in Summer 2020 and back to Perry, Georgia in Spring 2021. We hold rallies at least once per year just before the Family Motor Coach Association (FMCA) International Convention(s), usually in the summer. At our rallies we have a lot of fun visiting with old friends and making new friends with lots of dinners, lunches and golf tournaments. The American Coach service team typically attends our rallies and provides technical service and support. Labor is a free service to our rally members as a way to show their appreciation. 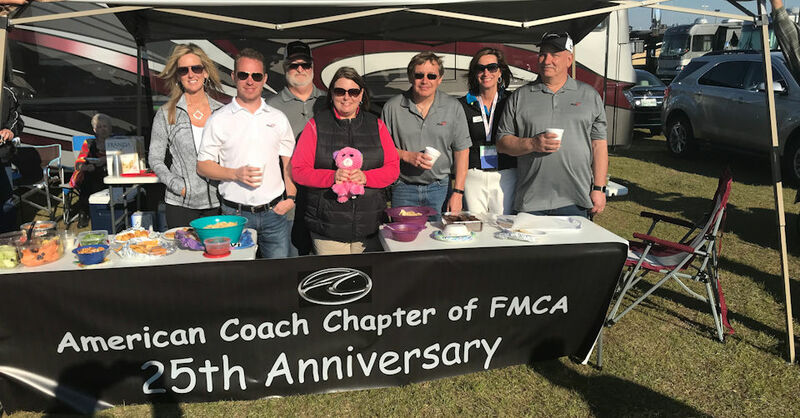 We are the Only American Coach Chapter of FMCA and we provide to our members camaraderie with other American Coach owners who are in our Chapter Club. 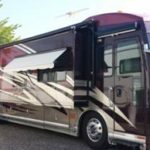 Our primary goals are to foster good relations with the American Coach, which is a division of Fleetwood RV. We build good relation between its management, their technicians and you the Coach owners. To be a member of our Chapter you must be an owner or part owner of an American Coach product which is the American Heritage, the American Revolution and Revolution, the American Eagle, the American Dream, the American Tradition, the American Allegiance and the Fleetwood Limited and be a member of FMCA.